Pacific Rim Cabinets is a medium sized cabinet manufacturing company located just outside Vancouver British Columbia and was established in 1997. Our history is a story with a rich tradition of building cabinets on the west coast of Canada and the progression of cabinetry in local, North American and international markets over time. Our products have been recognized as sustainable, formaldehyde free for a healthy home and culturally relevant in design. Collectively our staff has experience in single family, multi family dwellings, high rise residential, schools and community centres, professional office millwork, hospitals and senior citizen communities as well as LEED and FSC capability. Our work has won awards, been published and been televised. 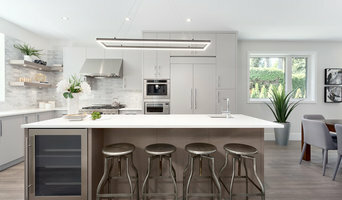 Most recently we won a Georgie Award for best kitchen renovation. 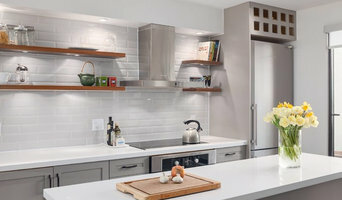 There is a formidable amount of energy, discipline, resolution and know-how which must be deployed in order to complete a kitchen project from start to finish. There are many parts to the whole both internally and externally in the entire process. We are experts in our respective fields that come together in a collaborative effort to provide an excellent experience for our customer. While we make it look easy, our staff of professionals work with an impassioned quest for finding solutions daily. Such knowledge has been patiently acquired and zealously maintained so that we continuously improve our systems and services. We are craftsmen fascinated by the material that we transform each day. We are also manufacturers contending with the changing of market trends, the environment and technology. But we are true to ourselves and maintain traditions in woodworking that are by hand...and this is the best way to provide quality and value for your investment. Throughout the company's development we have remained determined to offer our craftsmanship whereby it may be fully able to express itself, trying to meet the perfect compromise between quality control, productivity and affordability. In this respect our manufacturing process displays a remarkable versatile character and at the same time great flexibility. professional design and fabricator of interior cabinets and millworks. In addition, West Vancouver, BC cabinetry pros can help you give worn or dated cabinets a makeover. They can replace doors; add glass inserts, decorative moldings and other details; or give cabinetry a new coat of paint or specialty finish. Your cabinetry professional might work closely with a British Columbia kitchen designer, builder, remodeling contractor or interior designer. Here are some related professionals and vendors to complement the work of cabinets & cabinetry: Kitchen & Bath Designers, Kitchen & Bath Remodelers, Interior Designers & Decorators, Closet Designers and Professional Organizers, Woodworkers & Carpenters. Find a cabinetry professional on Houzz. Narrow your search in the Professionals section of the website to West Vancouver, BC cabinets and cabinetry. You may also look through British Columbia photos to find examples of cabinets that you like, then contact the cabinetry professional who worked on them.